A Peruvian woman sells fresh exotic produce. Alanah Eriksen reaches dizzy heights and has a few low moments on a culinary safari through Peru. Sometimes, it pays to travel with an empty stomach. Especially if you're an adventurous eater. If you're game enough to take on Intrepid's new Peru Real Food Adventure, go with an empty stomach and an open mind - and make sure you take some bigger pants. They'll have you scoffing cutesy guinea pig, fluffy alpaca and the testicles, hearts, hooves, brains and stomachs of more animals than you can remember. But when in Peru, it'd be rude not to do as the locals do. The 11-day trip covers Lima, Ica, Cusco and the Sacred Valley, Aguas Calientes and Machu Picchu. As media, we were treated to a condensed "highlights" version, kicking off in the capital, Lima. With a group of six journos from three different countries, you're never going to please everybody's tastes, but it was extra hard when you had an Irishman allergic to fish, and a gluten-intolerant Kiwi (me). Throw four Aussies in the mix and it's a recipe for a few upset stomachs. We did have an Australian-based Peruvian (Alejandro Saravoa, owner of Sydney's fine dining restaurant, Morena) and a local guide, Luca, to smooth the transition. Probably the best way to ease into the food frenzy was a relaxed meal at Huaca Pucllana, which overlooks the ruins of a clay pyramid of the same name. Built between 200 and 700 AD, the staggered platforms were constructed by elite clergymen as a ceremonial centre. The formations lit up at night and provided a magnificent view as we wined and dined at the eatery, which can seat up to 600 people for special occasions. It was there we first tried chicha morada - a sweet local beverage made from purple corn which we would soon become addicted to. The colour would no doubt be a little off-putting to some, but we learned to overlook it and it became the non-alcoholic drink of choice. Tapas (snacks) were on the menu, with lomo saltado going down a treat. The traditional stir-fry that typically combines marinated strips of sirloin steak with onions, and tomatoes, is a staple of many Peruvian restaurant menus, often served with potato and rice. We retired for the night to Hostal Buena Vista, a renovated 12-room house in the popular suburb of Miraflores, which is near the beach and known for its good restaurants and shopping. But we didn't have a lot of time to enjoy the cozy digs as there was more eating to be had. We had an early start the next day starting with a walk to a local bakery, T'anta. A Peruvian woman prepares tradition food. Our Intrepid guide Luca thankfully warned us that a couple of months prior, Lima had featured in a documentary on the Discovery Channel called Don't Drive Here. The busy city's traffic and driver habits put it on par with New Delhi, Bangkok, Manila, Mexico City and Ulaanbaatar in Mongolia. So after dodging a few taxis, bearing the brunt of a few horns and squeals, we made it safely to the Miraflores spot. It serves a combination of traditional Peruvian dishes and modern snacks. I tried my first tamale - a dish made from corn-based dough which can be filled with meat, cheese of vegetables. It seemed like an odd thing to be eating for breakfast, but as I soon found out, the diet rules were different in Peru. Also on the menu (but not needed yet) was tiger's milk. This combination of raw fish, lime juice and chilli apparently works wonders on a hangover. Lunch came not long after with a visit to the highly-anticipated - for me, not the fish-hating Irishman - fish market in the Chorrillos District on the water. The catch couldn't have been any fresher. We watched as the fisherman came in with their dinghies full. The fish was slapped on the tables at the market and you could ask the local women to fillet it for you, or take it over to the strip of mini restaurants next door and get them to do it for you. There are about 20 makeshift stalls to choose from. They were started mainly for the fisherman, who spent all day on the coast, but the locals soon became interested in the spot and tourists are slowly starting to frequent the stalls. We chose Cevichera Florcita, named after the owner, Flor. She filleted and chopped up the fish before Alejandro taught us how to make ceviche - a meal popular in Central and South America where the fish is "cooked" using lime and lemon juice and chilli. As a pre-lunch snack, we were introduced to cancha - toasted corn nuts covered in salt. It's a nicer alternative to the salty peanuts you'll find at many Western bars. Afterwards it was straight on to Lima's Central Market and Chinatown - where we had a quick-fire lesson on the country's tropical fruits. Just a row over from the full-bodied goats (with fluffy tails intact to prove they weren't dogs), was the Fruteria Sonia stall. Some of the exotic delights included: aguaymanto (cape gooseberry), starfruit, ciruelas, pepino, lima, chirimoya, granadilla, camu camu, tumbo and cocona. The aguaymanto, which looks like a miniature yellow tomato and has a paper-like husk around it, was the favourite, and so cheap too. One Peruvian nuevo sol (42 NZ cents) bought about 20. The sweet delights made for a bizarre juxtaposition next to the brains, hooves, testicles and stomachs of Peru's native wildlife hanging from other stalls. 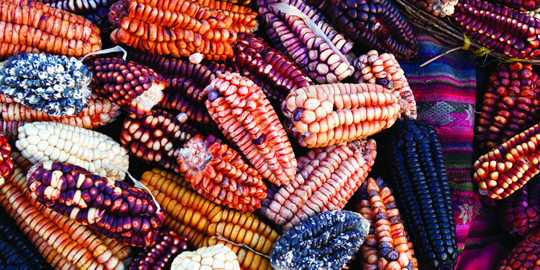 Market offerings include coloured corn. A 5.8 magnitude earthquake, which barely rattled the ground for us, as its epicentre was miles away, caused a bit of excitement. Peru is prone to quakes but the locals still squealed and the cellphone signal was down as everyone tried to call their families in other parts of the city. They crowded around a small television on the wall to watch breaking news of the event. Night bites in the city included picarones - a deep fried pumpkin dessert which would give donuts a run for their money - and arroz con leche, a rice pudding with condensed milk and cinnamon. The next day it was a four-hour drive in our bus to Ica, about 300km south of Lima - stopping for breakfast along the way of course. But this was no Weet-Bix and milk. "Breakfast" was a dish made of fried pork rinds, on bread. Called chicharron, the deliciously fatty meal is made with female pigs only, as they're apparently more tender. Add salsa and sweet potato and you've eaten enough to last you the day (or longer). We dined at a restaurant named Sarita in a town called El Silencio near the beach. It's a hit with the surfers. Further south along the Pan-American Highway you will come to Tambo Rural, where they make bread in wood-fired ovens. My gluten-free stomach kept me from the delicious treats, though the smell was almost enough to tip me over the edge. Our accommodation in Ica was the gorgeous Hotel Vinas Queirolo, set in the middle of a 400ha vineyard. Its massive rooms were the perfect place to recover from another day of eating. The temperature in Ica was a lot hotter than Lima and the place had a more relaxed feel about it, so we ignored out burgeoning stomachs and slipped into our swimwear for a few dips in the hotel pool. Unfortunately, the last few days off stuffing my face finally caught up with me. I spent one of the nights praying to the porcelain gods and wasn't able to join the group for a day of sandboarding and 4WD at nearby Huacachina, famous for its massive sand dunes. This meant I was ill on the day guinea pig was on the menu - but my travel companions said I didn't miss a lot. It was served with the head still intact, and was very hard to get any meat off the small rodent, they said, though the skin was chewy and it tasted a bit like rabbit. Meanwhile, the chicken soup back at the hotel was the perfect dish to ease me back into eating. We headed back to Lima for our flight to Cusco, in southeastern Peru - of course stopping for a bite on the way. I was still picking at my food at this stage but I couldn't resist Cala seafood restaurant's sweet potato bites. The eatery is a Miraflores gem, sitting on stilts overlooking the crashing waves. We were back wearing jackets in Cusco, which is 2800m above sea level. To soothe unsettled stomachs and cope with any potential altitude sickness, we sipped hot water with coca leaves at our hotel, Tika Wasi, in the suburb of San Blas. The leaves of the coca plant contain alkaloids which - when extracted chemically - are the base for cocaine, so coca is illegal in many countries, though it apparently has many medicinal uses. San Pedro market was a highlight of Cusco, with stalls offering all the juice combinations you could think of. Medicine stands claimed to cure anything, including cancer and Alzheimer's, and chocolate and coca tea were on my shopping list for family back home. But it was "the frog lady" we were on the lookout for. Our guide had warned us to watch out for the notoriously cranky elderly lady who has been selling frogs at the market for years. "Don't look her in the eye and don't take photos," he said. And when we stumbled across the so-called frog maiden, we saw her whack a stray dog with a stick. We then headed out to a cooking class run by the Rupa Wasi Tree House Restaurant. Its kitchen is nestled among ancient Incan temples and burial sites still under excavation in the Cusco countryside. Juicy, tender alpaca loins were the main course, and our group was keen for seconds. Thankfully, the day ended with a walk down the hill, back to the hotel, so it felt as though we were working off a little of the week's food. We flew back to Lima before we parted ways for our respective countries, a few kilograms heavier but a lot more food savvy. Getting there: LAN operates six flights per week from Auckland to Santiago, Chile with connections to Lima, Peru. Further information: Intrepid's Real Food Adventure in Peru takes 11 days. The trip covers Lima, Ica, Cusco and the Sacred Valley, Aguas Calientes and Machu Picchu and costs $3515 for accommodation and local transport including a domestic flight, 10 breakfasts, two lunches and three dinners. Call 0800 600 610 for more details. Alanah Eriksen travelled as a guest of Intrepid Travel and LAN Chile.